Steel exterior doors with glass often have what looks like a grid of small windows. But in reality, those windows are a single thermal glass unit with a plastic frame that creates the appearance of individual, or "divided-light," windows. 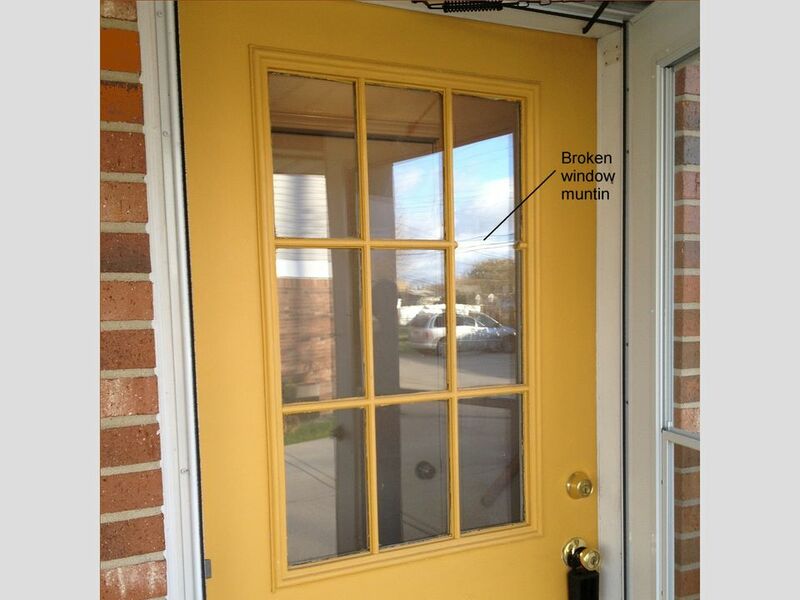 If one of the frame pieces (called muntin bars) is damaged, you can simply replace the frame. Frames are typically sold as kits that include both interior and exterior frame halves. You can find replacement kits at home centers and online, or contact the door manufacturer for recommendations. Use a utility knife to cut through the paint film where the decorative window frame meets the door, starting at one corner and working around the perimeter. Cut just deeply enough to break the paint or caulk sealing the frame to the door. Do this on both sides of the door. Remove the screws securing the exterior and interior halves of the plastic frame together, using a screwdriver. If the screws are concealed beneath plastic plugs, take another screw and screw into the plug about 1/4 inch, then pull the screw straight out, with the plastic plug attached, then remove the frame screw. Remove the interior half of the window frame. You may have to use a putty knife or similar thin-blade tool to get under the frame to gain leverage. Remove the exterior frame and glass panel. The glass panel will be attached to the exterior frame with adhesive, so the two pieces will come out together. Lay the glass panel and frame on a solid flat surface with the exterior frame facing up. Carefully remove the frame from the glass, using a putty knife or razor scraper to cut through any old caulk holding the frame in place. Use a razor scraper to clean the glass of all old paint and adhesive residue on both sides of the glass panel. Keep the razor's edge flat on the glass so as not to scratch it. Clean glass panel with glass cleaner. Separate the two halves of the replacement frame assembly and place the half with no screw holes face down on your work surface. The side with no screw holes is the exterior side of the frame. Apply a continuous bead of clear silicone caulk around the perimeter of the exterior frame half. Carefully lay the glass unit onto the exterior half of the plastic frame, and press the window into place. Expect some caulk to ooze out. This is normal, and you can clean it up later with rubbing alcohol once the window is in place but before the caulk dries. You can also remove traces of dried caulk with a razor scraper. Carefully lift the exterior frame and glass assembly into the door opening from the outside of the door. Have a helper hold the unit in place from the outside while you position the new interior half of the frame on the inside of the door and secure the two halves with the provided screws. Note: The interior half of the frame does not need to be caulked. Insert the plastic screw hole plugs that came with the kit, as applicable, to conceal the screws on both sides of the door.